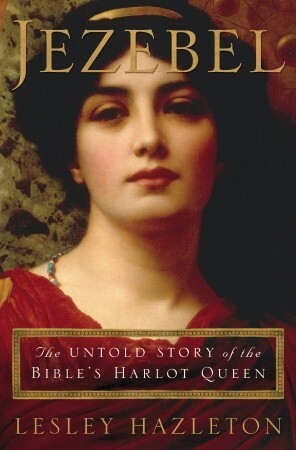 Jezebel: The Untold Story of the Bible’s Harlot Queen, by Lesley Hazleton – This book examines the reputation of one of the most infamous figures in the Bible, the wife of King Ahab of Israel and daughter of the King of Tyre. As a powerful and influential woman in a patriarchal setting, she’s definitely someone who deserves a revisit. I’ve seen indications elsewhere that Ahab, portrayed as a total villain in 1 Kings, was actually pretty good in terms of bringing prosperity to his kingdom. He invested in building projects and made trade agreements with neighboring countries. Ahab also doesn’t appear to have totally abandoned the worship of Yahweh, as he consults prophets of the national deity before going into battle. Rather, he legitimized the worship of Phoenician gods alongside Yahweh, which could be considered a precursor to religious freedom, but was a total no-no according to the compilers of the Deuteronomistic History. So was making peace with an enemy king; the general policy in the region at the time was subjugation or total destruction. Jezebel herself has come to be viewed as a whore, when evidence suggests she was actually quite loyal to her husband. Rather, her being a harlot was slang for driving Israel into polytheism, as the nation was the bride of Yahweh. She was quite formidable, someone who could stymie even the fierce and fiery prophet Elijah, and who maintained power after Ahab’s death when their sons ruled Israel. When she finally met her death at the hands of Jehu, who instituted a coup with the support of Elijah’s successor Elisha and assassinated the rulers of both Israel and Judah, she was proud and defiant to the end. Hazleton, a former psychologist who spent a lot of time in Israel, does some interesting speculation into the viewpoints of Jezebel and her opponents. Still, we can’t really know the minds of people who died nearly 3000 years ago, so it can hardly be considered entirely factual. Still, it was a fascinating read, and an example of how differently someone from the past can be viewed by historians with different agendas. The author also proposes that temple prostitution was a myth spread by opponents of Semitic religions, particularly Herodotus. I do have to wonder what she thinks of the Epic of Gilgamesh, which gives a positive portrayal of a temple prostitute as the one who tames Enkidu. By the way, I know it’s traditional to leave a place for Elijah at the Passover Seder, but would you really WANT a guy who brought drought on his own homeland and led the slaughter of 850 priests of an opposing religion as a guest? This entry was posted in Book Reviews, Feminism, History, Judaism, Middle East, Religion and tagged 1 kings, ahab of israel, bible, deuteronomistic history, elijah, elisha, herodotus, israel, jehu of israel, jezebel, lesley hazleton, tyre. Bookmark the permalink. There’s evidence throughout the ancient world for the practice of temple prostitution, just as there is for the then common practice of animal, human and infant sacrifices, particularly amongst the Canaanites. Authors like the one you cite above attempt to sell books by creating fake controversy and rewriting history, portraying the ancient world through the lens of modern eyes, and failing to see that tolerance of Phoenician worship could never rightly be called “religious freedom,” unless one considers freedom to be enslavement to lies and the pernicious and murderous rites inherent to their religion, which is attested to by documented cases in which Israel tolerated and even intermingled worship of Baal with Yahweh (both of which were strictly against Yahweh’s directive), resulting in them falling into vicious and horrific practices. Elijah’s welcome at my table because he had the courage to stand up against murderers, liars and thieves, which is what constituted the Baal priesthood. All these attempts to rewrite history are just that, and not worth the paper they’re written on because they’re based in bias (which attempts to make the writers of the Bible the “bad guys”), founded on speculation, half-truths and outright falsehoods. The Old Testament champions women, including those of different faiths and cultural backgrounds, such as Ruth and Rahab. But trying to say that Jezebel was some proto-feminist hero of the ancient world is like trying to say that Countess Bathory was a radical champion of anti-patriarchy. It’s nonsense. I don’t understand why it’s so hard to believe that there could have been a power-hungry murderous queen when we have so many indisputable examples in recent history. 500 years from now are we going to start seeing books saying how Polpot and Stalin were actually misunderstood and propagandized by their enemies, that they didn’t really slaughter all the millions of people they did? That the evidence for that was really misinterpreted or distorted? That their writings really only reflect a “symbolic genocide written in poetic form to talk about the destruction of Capitalism”? Elijah’s welcome at my table because he had the courage to stand up against murderers, liars and thieves, which is what constituted the Baal priesthood. But was he not himself a murderer according to the Biblical account? And this was written by people who presumably supported Elijah and his beliefs. 500 years from now are we going to start seeing books saying how Polpot and Stalin were actually misunderstood and propagandized by their enemies, that they didn’t really slaughter all the millions of people they did? That the evidence for that was really misinterpreted or distorted? There’s probably already some of that, but we have evidence that they DID commit a lot of atrocious acts. For a ruler thousands of years ago, the evidence is pretty fragmentary. You seem to be arguing from the position that the Biblical account HAS to be right and anything taking a different position wrong, while my own is that all we can really do these days is speculate. From most of what I’ve heard, EVERY ruler back then was pretty god-awful by modern standards, so no, I don’t think Jezebel was someone who would be embraced by the modern feminist movement. But was she necessarily worse than her peers? Maybe and maybe not. The impression I get is that the Biblical writers thought mass murder was okay if done by someone on their side, but not by anyone on the other. The way I see it, it’s bad regardless of which god you worship. Is any book that goes against the Biblical account “not worth the paper it’s printed on”? Capital punishment in ancient Israel wasn’t considered murder, just as it’s not considered murder now. Putting to death those who supported child sacrifice, amongst a host of other evils, was then (as now) seen as a necessary evil by those who would oppose such practices. I’m arguing from the position of those in the ancient world; so judging through the lens of modern eyes would make them all look horrendous, but that does a disservice to the reality of the times and peoples. Taking the ancient accounts at face value alone, it’s clear that the biblical writers were ultimately imperfect, but of far higher morals than their peers, expressing candor at the shortcomings of themselves, the nation and their leaders, and striving to protect the most vulnerable in society, and finally speaking truth to power. Even though they used violence, the goal was always to preserve a foundering nation, to achieve peace, and to eliminate warmongering peoples who had no compunction against committing gross evil against innocents. Having spent years studying the subject without denominational bias and echo chambers, open to the evidence and various perspectives, I tend to find any book or author who distorts the facts to be worthless IMO. Being open to opinions and possibilities is one thing, but those who spread and perpetuate lies and half-truths as if they’re facts is just not high on my tolerance list. Do we have evidence that Jezebel and her priests would have supported child sacrifice? Even if it’s a historical fact that some cultures in the area practiced it, that doesn’t mean all of them did. But even if we do assume the priests were committing atrocious acts, it’s faint praise to say that the worshippers of Yahweh were ever so slightly better. Yeah, they were cool with genocide, holy war, and slavery; but they drew the line at human sacrifice! And would Elijah really have had the authority to institute capital punishment? Maybe he did, as religious leaders had a lot of power back then, but what would it have really accomplished? If your religion is really so much more moral, killing a bunch of people isn’t the best way to prove that. And I hardly think a society whose own myths say that they outright slaughtered the previous inhabitants of the land (whether or not that’s actually true) can say that peace was their goal. Should we assume that EVERY person killed by followers of Yahweh deserved it? Did they necessarily all support human sacrifice or sexual slavery? And even if they did, how is killing the best way to get people to change their minds on such matters? They can’t very well change them after dying. Being open to opinions and possibilities is one thing, but those who spread and perpetuate lies and half-truths as if they’re facts is just not high on my tolerance list. All I can think of that could be considered “lies and half-truths” is that Hazleton doesn’t think temple prostitution actually occurred, when you say there’s evidence that it did. But how does that one point make the whole book (of which that argument was a small part) worthless? People who are wrong about one thing aren’t necessarily wrong about everything, are they? I guess I’m mostly just surprised that you would find what I saw as a pretty innocuous read to be so offensive. Because these kinds of books that look to rewrite history are so pervasive now, and I read reviews where people take them at face value. Authors like these (and Ehrman’s guilty of this too) put forth their hypotheses as if they’re incontrovertible truths. That’s disingenuous at best. As much as I detest religious dogma, I also detest pseudo-academic dogma. As to your earlier points, I commented on some of that in the post I wrote just prior to this, so I’d only add that it was a very brutal world. But the laws governing slavery and war in ancient Israel were FAR above those of the surrounding nations, which were rapacious and had no moral guidelines in those areas apart from the will of their kings. And the times where Israel failed and fell into cruelty, violence and religious prostitution (which condoned cruelty and violence), they were called out on it! That level of candor and social criticism can’t be found in any other official writings of the nations of the ancient world. Unlike Babylon, Egypt and Canaan, the kings of ancient Israel were not gods. Nor were they above the law. When the nation of Israel was at their best, they represented a striking difference to the rest of the ancient world. Because these kinds of books that look to rewrite history are so pervasive now, and I read reviews where people take them at face value. Authors like these (and Ehrman’s guilty of this too) put forth their hypotheses as if they’re incontrovertible truths. I’ve never really gotten the sense that Erhman or Hazleton was telling anyone else what to believe, just what THEY believed and why. It certainly wouldn’t help the flow of a book to add every few paragraphs that they’re not entirely sure and opinions may vary, as that pretty much goes without saying. That’s definitely a matter of opinion, though; I’ve probably found some things preachy that other people didn’t at all. And the times where Israel failed and fell into cruelty, violence and religious prostitution (which condoned cruelty and violence), they were called out on it! That’s sometimes true, but I have to suspect that the constant admonishments to only make sacrifices at the Temple in Jerusalem weren’t so much about morality as about eliminating competition. The main sin of a lot of the kings didn’t seem to be human rights violations so much as allowing sacrifices in other places. Not incidentally, I do want to add that this is not a justification of violence, even when violence is used for genuinely noble purposes. Violence ultimately doesn’t work in the end, yet for nonviolent efforts to have any effect, culture and society had to be evolved to a certain level where such means could take root and flourish. In the ancient world, that was not yet the case, and evidence shows that nations were comprised of people who were far less individualistic (a much more modern trait), harder, and more subservient to the iron will of its leaders. You did not have many conscientious objectors in ancient Assyria, or amongst the Amorites and Amalekites, and if there were, they would have moved out of the nation. The point being that the culture and practices of the ancient world were in some ways very alien to the world we now know. If individualism was virtually unknown, however, wouldn’t it have been enough to replace the leaders and institute new laws that forbade human sacrifice or whatever? People who just went along with the tribe presumably wouldn’t have much objection to that if they weren’t used to thinking for themselves anyway. Considering we’ve had thousands of years to hear about how awful those idol-worshipping, baby-sacrificing polytheists were, while neatly pushing aside anything nasty that monotheists did as “well that was just a political/cultural thing, it’s not part of our religion! We’re all peaceful & nice!” I’d be interested in hearing a different perspective. We need to separate out “common wisdom/sense” from “common prejudices and assumptions”. Yes, but only when it’s true. Replacing fact with fiction because it suits our current anti-religious left cultural bias is no better than blindly accepting tradition because it’s tradition. The evidence from too many documents from the ancient world, as well as archeology, continues to support the fact that the Canaanites sacrificed infants. Well, I’m not anti-religious, I’m a modern polytheist myself, but at the same time, I agree that I prefer to have historical information that is unbiased as possible towards both polytheistic & monotheistic religions. But that is difficult to come by! Caelesti: I think you nailed it on the head. We live at a time when information is overly abundant, and yet so much of it is contradictory, false or only half-true, and wading through that can be a real task. Some of us only trust in academia; after all they’re supposed to be the bastions of unbiased research; yet time and again we discover that bias and money play a huge role in academia (e.g., this recent news article is but one in a long line of examples: http://theweek.com/articles/618141/big-science-broken), which has become conservative, reductionist and conformist. Then there are those who only trust in outsider or fringe sources of study, as they have often been at the forefront of new discoveries and ways of thinking (often by challenging the orthodoxy) and yet there is a danger there of pseudoscience, extremism and throwing out the baby with the bath water. It’s a complex issue, but I’ve always relied on those rare individuals who manifest the three H’s, honesty, humility and hunger, and they’re in both camps above. Honesty means they care about the truth above things like grants and peer pressure; Humility allows them to acknowledge when they’re wrong (or might be wrong). Hunger is the striving for the truth. As you noted, such ones are not so easy to come by! But wasn’t the practice of the Israelites, as least as described in the book of Joshua, to kill all of a defeated enemy tribe INCLUDING the children? Child sacrifice was a horrific thing, no doubt about it, but wouldn’t conquest by Israel have meant the deaths of even more Canaanite children?